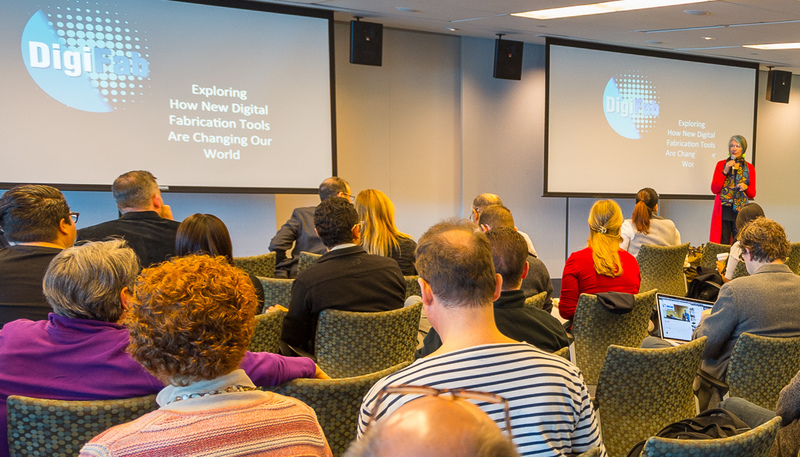 Thought leaders in 3D Printing, Smart Manufacturing, New Collar Workforce training, STEM education and Entrepreneurship explore how new digital fabrication tools like 3D Printing are changing the world, at the Digital Fabrication Conference. Fab Lab Hub welcomes America Makes, the Laser Institute of America and The Fab Foundation as collaborators for the sixth annual DigiFabCon to be held at the Schaumburg (Illinois) Convention Center. DigiFabCon explores how tools such as 3D Printing, laser cutting, CNC machining, robotics and CAD design are changing the world. Thought leaders will share how they are innovating through digital tools today and predict what the future holds in workforce training, manufacturing, STEM education, startup creation and technology. The DigiFabCon Conference takes place March 27 and 28, 2018. Sherry Lassiter, President of the Fab Foundation and Director of the Fab Lab Program at MIT’s Center for Bits and Atoms, opens the program with a keynote featuring projects from the more than 1,000 Fab Labs that are part of the worldwide network. Rob Gorham will review industry advancements fostered by America Makes, the public/private partnership for additive manufacturing for which he serves as Executive Director. He will also moderate a panel on Innovative Initiatives to Train the New Collar Workforcethat includes Jeannine Kunz, Vice President of Tooling-U SME. A wide range of expert presentations and panel discussions will continue on both days.